Get The Morning 8: The eight stories you need to know, bright and early. (Newser) – Pretty soon, one lucky American will get to come home to naked Donald Trump every night. 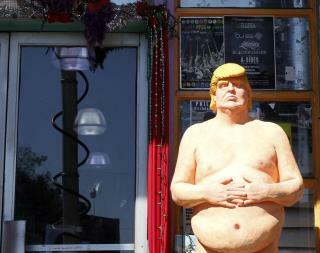 The San Francisco Chronicle reports one of the explicit Trump statues that made headlines when they popped up around the country last month will be auctioned off on Oct. 22. The statues created by an anarchist artist collective and dubbed "The Emperor Has No Balls" were erected in Los Angeles, Cleveland, Seattle, New York, and San Francisco, according to Reuters. But the Los Angeles statue was the only one not seized or destroyed by authorities. "The explicit statue quickly became a symbol of political protest art," CNBC quotes Julian's Auctions as stating. HA,HA,HA! At least they gave TRUMP a GOOD head of HAIR on his HEAD! There ya go ALL!! © 2019 Newser, LLC. All rights reserved.